Global sea level rise is a result of both ocean thermal expansion and glacier melt. This graphic could serve as a great introduction to help students identify how glaciers contribute to sea level rise via volume and area. An explanation of how scientists compute this is also provided. The surrounding text is written in clear but technical language. Details and references are included. The network of lower latitude small glaciers and ice caps, although making up only about four percent of the total land ice area, may have provided as much as 60 percent of the total glacier contribution to sea level change since the 1990s. 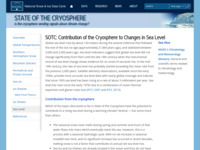 Comments from expert scientist: Breaks down major contributors to modern and projected sea-level rise and assesses the contribution of each (2009 data). Includes a histogram and a plot each showing real data illustrating points covered. Since the supporting background is written scientifically, educators will need to develop their own context and inquiry questions for this resource. While these two visualizations convey important information about sea level rise, there are no supporting educational materials to make it easier for educators to present it to their students. MS-ESS2.C5:Water’s movements—both on the land and underground—cause weathering and erosion, which change the land’s surface features and create underground formations. MS-C1.3: Patterns can be used to identify cause and effect relationships. MS-C2.2:Cause and effect relationships may be used to predict phenomena in natural or designed systems. MS-C7.1: Explanations of stability and change in natural or designed systems can be constructed by examining the changes over time and forces at different scales, including the atomic scale. MS-C7.3:Stability might be disturbed either by sudden events or gradual changes that accumulate over time. HS-ESS2.D4:Current models predict that, although future regional climate changes will be complex and varied, average global temperatures will continue to rise. The outcomes predicted by global climate models strongly depend on the amounts of human-generated greenhouse gases added to the atmosphere each year and by the ways in which these gases are absorbed by the ocean and biosphere. HS-ESS2.E1:The many dynamic and delicate feedbacks between the biosphere and other Earth systems cause a continual co-evolution of Earth’s surface and the life that exists on it. HS-C1.5:Empirical evidence is needed to identify patterns. HS-C2.1:Empirical evidence is required to differentiate between cause and correlation and make claims about specific causes and effects. HS-C7.1:Much of science deals with constructing explanations of how things change and how they remain stable. HS-C7.3:Feedback (negative or positive) can stabilize or destabilize a system.